Migration has been a constant through human history. In recent years, there is a growing perception among policy makers and states that migration, especially of low skill migrants, is a problem, especially as migration from Central America and Mexico to the United States continues in spite of efforts to “seal the border” both in the United States and Mexico. Additionally, the Obama Administration’s deportations have reached record numbers. The Mexican and Central American governments, despite some efforts, have been unable to absorb a large number of deportees and to help them reintegrate in society. But sealing borders and increasing deportation ignores the actual problems at the root of the migration crisis, such as poverty, lack of economic opportunity, and violence. In the Northern region of the Americas there are important migration issues that deserve attention and analysis: (1) Migrants from the “Northern Triangle” (Honduras, Guatemala and El Salvador) who continue venturing through the Migration Corridor in Mexico are exposed to multiple dangers ranging from violence from criminal gangs to abuses from immigration authorities. (2) Along the corridor there has been a growing number of humanitarian responses, many of them faith based, which advocate for and assist migrants along their journey. (3) The deployment of military forces and migration officers along the U.S. border with Mexico and the increasing violence and activity of criminal gangs on Mexican territory make irregular crossings to the U.S. a daunting task. (4) Migrants who have made it to the U.S. usually face challenges as they try both to acculturate and live under the radar as undocumented migrants. None of these scenarios is exhaustive. These serious issues are a call to accompany, serve, and advocate on behalf of these populations that are at the margins of our society. Migration is a worldwide priority of the Society of Jesus and a focus area for advocacy at the Jesuit Conference in the United States. The Jesuit Conference has been sponsoring a five-week Migration Immersion Experience for Jesuits in formation. The journey begins in Los Angeles with a three-day seminar to understand certain dynamics of migration and the type of experience we will have. We then visit El Progreso, Honduras, to understand the context of origin. We continue moving through the migrant corridor in Mexico visiting shelters that provide services to and advocate for migrants in transit. We conclude by visiting the California Valley to understand destination contexts. During this experience, we visit shelters, human rights organizations, parishes, and particular Jesuit projects that assist migrants. The goal is to offer Jesuits in formation a firsthand experience of the reality of migration, as well as to inform them of the political and pastoral challenges involved in it. In 2015, I led the migration immersion experience for six Jesuit scholastics (four Americans and two Mexicans), with the sponsorship of the Social and International Ministries of the Jesuit Conference in the United States and the Mexican Province of the Jesuits. We saw firsthand the phenomenon of migration through visits to the “Northern Triangle (Guatemala, El Salvador, and Honduras), the Mexican Migration Corridor, and some immigrant communities in the U.S. in order to understand migration from various viewpoints. It was also an opportunity to reflect on opportunities for ministry among migrants. Praying as community of salt and light means that we bring our reality to prayer and let prayer enlighten our reality. For us here in the Diocese of El Paso, we do this in a variety of ways but one of the most special prayer traditions we have developed is our annual Border Mass. 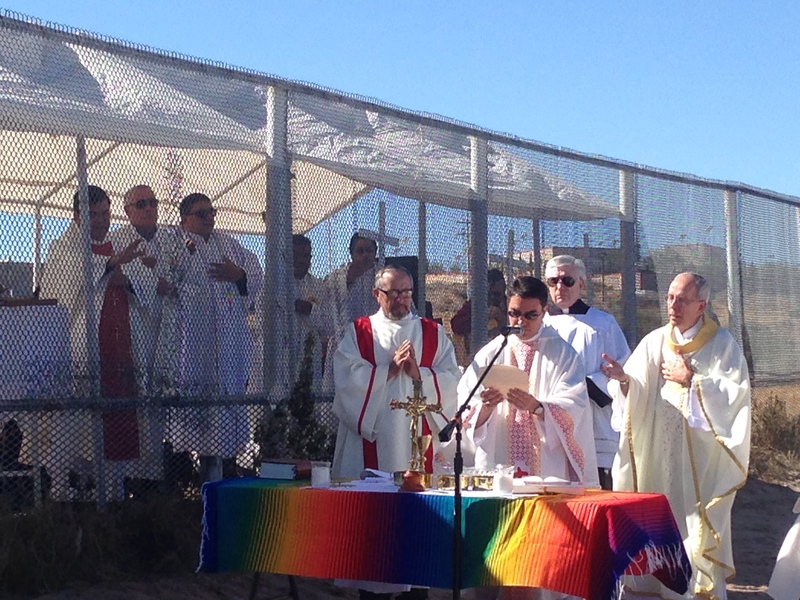 Every year in November, around 600 people on both sides of the border celebrate the Eucharist right smack on the US-Mexico border fence. Dioceses on both sides – Mexico and the United States – come together around the altar placed against the fence and remember that we are ONE PEOPLE OF GOD. We are two nations, one faith. And, nothing can separate us from the love of Christ: not detention, not deportations, not family separation, not death in the desert, not the hardened heart of our nations, not prejudice or discrimination, not abuse, not violence, drug trafficking, nor militarized or inhumane border enforcement. Each year, the bishops of the diocese of Las Cruces, El Paso, and Juarez come together and take turn presiding and preaching. We bring our reality of immigration, the lives and needs of our immigrant brothers and sisters, to the Eucharistic table and pray. We pray for our migrant brothers and sisters who have died in the desert, for a deeper encounter with Christ, for a conversion of hearts and minds, for communion and solidarity. We can pray that we may become more welcoming and respectful of the human dignity of our migrant brothers and sisters. We pray for courage to continue advocating for comprehensive immigration reform. Celebrating Mass at the border makes prayer incarnate in our daily lives. I understand that this form of prayer is a bit harder to reproduce where there is no physical international border, but it is not impossible if we use our imagination and creativity. You can celebrate a border Mass in your diocese or parish in unity with the border Mass we celebrate on the border in November by celebrating at the same time we do ours, so we can all be united. Imagine if on that day we celebrate our border Mass here in El Paso, there would be several Masses going on in our nation at the same time! You can also celebrate a Mass for immigrants and the immigration issue where the readings, preaching, intercessions, and call to action focus on migration. You can also simulate a border either outside or inside a church by building a border out of simple building materials (a few studs and wire, for example). You can divide the church aisle with your fence or you can build the fence in front (on the side or behind the altar or another area in your church) and place pictures of all the borders we build, physical or otherwise, such as prejudice, racism, fences, or a hardened heart. Let us continue to pray that our border Masses be always turned into bridge Masses. 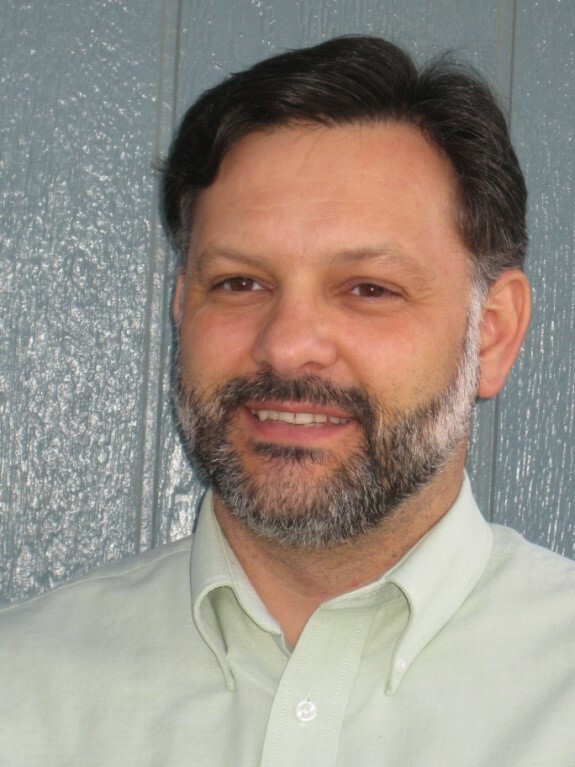 Marco Raposo is Diocesan Director of the Peace and Justice Ministry in the Diocese of El Paso. Be a community that builds bridges! Get resources on praying together as and celebrating our diversity as one body in Christ. I was blessed to be able to join “Pope Francis VIPs” as they attended a Mass on the United States-Mexico border. These VIPs were not CEOs, VPs, or celebrities. Rather these VIPs were, as defined by Pope Francis, migrants, undocumented immigrants, unaccompanied minors, and family members separated by massive fences, armed security, and outdated immigration laws and policies. Prior to the Mass, we gathered for a couple hours in St. Pius parish hall waiting for our turn to be processed through security. In the hall was an air of nervous enthusiasm, as we really didn’t fully grasp what we were about to experience. The VIPs were excited to meet cardinals, bishops, and Church leadership. There was an obvious gratitude for the work of the Church on immigration and legitimate care for the migrant. After being processed through security, we were bussed to a levee that separates El Paso, Texas USA and Juarez, Mexico. Pope Francis ascends memorial to pray for migrants. Photo taken from the U.S. side of the border. Heavy on most of our minds were the thousands of people who have died in efforts to cross the border in hope of a better life for themselves and their families. Pope Francis himself spent several minutes of silent prayer on behalf of those lost lives. During the Mass, despite a well-fortified border and active patrolling security, an incredible peace surrounded us, a calmness that was not the result of fences or firearms. For a brief moment, the border was inconsequential. Prayers and supplications flowed on both sides as freely as the birds that circled above us. Together we prayed for generations past and for those yet born. We prayed that their lives may be lived to the fullest, and we remembered that no border can stop us from being one family. Tuve la bendición de poder acompañar a las “VIPs del papa Francisco” cuando asistieron a una Misa en la frontera entre Estados Unidos y México. Estas VIPs (personas muy importantes) no eran directores generales, vicepresidentes o celebridades. Más bien estas VIPs fueron, como las definió el papa Francisco, migrantes, inmigrantes indocumentados, menores no acompañados y miembros de familias separadas por grandes vallas, seguridad armada y leyes y políticas inmigratorias obsoletas. Antes de la Misa nos congregamos un par de horas en el salón parroquial de San Pío esperando nuestro turno para pasar el proceso de seguridad. En el salón había un aire de entusiasmo nervioso, ya que realmente no comprendíamos del todo lo que estábamos a punto de experimentar. Las VIPs estaban contentas de reunirse con cardenales, obispos y líderes de la Iglesia. Había una obvia gratitud por el trabajo de la Iglesia en materia de inmigración y cuidado legítimo del migrante. Después de pasar por el proceso de seguridad, fuimos trasladados en bus hacia un dique que separa El Paso, Texas, Estados Unidos, de Juárez, México. Papa Francisco asciende monumento a orar por los migrantes . Foto tomada desde el lado de EE.UU. de la frontera. En la mente de la mayoría de nosotros estaban muy presentes los miles de personas que han muerto tratando de cruzar la frontera con la esperanza de una vida mejor para sí y sus familias. El propio papa Francisco pasó varios minutos de oración en silencio en nombre de esas vidas perdidas. En su homilía, el Santo Padre dijo: “Esta tragedia humana que representa la migración forzada hoy en día es un fenómeno global. Esta crisis, que se puede medir en cifras, nosotros queremos medirla por nombres, por historias, por familias. Son hermanos y hermanas que salen expulsados por la pobreza y la violencia, por el narcotráfico y el crimen organizado. Frente a tantos vacíos legales, se tiende una red que atrapa y destruye siempre a los más pobres. No sólo sufren la pobreza sino que además tienen que sufrir todas estas formas de violencia. Injusticia que se radicaliza en los jóvenes, ellos, ‘carne de cañón’, son perseguidos y amenazados cuando tratan de salir de la espiral de violencia y del infierno de las drogas”. Me hizo recordar cómo, al querer probar nuestros argumentos, recitamos números, índices y estadísticas, que no comparten la historia humana, que pasan por alto los rostros de las personas y la realidad de nuestra humanidad compartida. Esta compartición “santa” me impactó más cuando las personas del lado de Juárez de la frontera y del lado de El Paso recibieron la comunión: un solo Dios, una sola Iglesia, una sola fe y una sola familia, todos compartiendo al mismo tiempo el Cuerpo de Cristo. Escuché al papa Francisco al final de su homilía cuando dijo: “…podemos orar, cantar y celebrar juntos ese amor misericordioso que el Señor nos da y que ninguna frontera podrá impedirnos compartir”. Durante la Misa, a pesar de una frontera tan fortificada y el intenso patrullaje de seguridad, una paz increíble nos rodeaba, una calma que no era resultado de los cercos o las armas de fuego. Por un breve momento, la frontera fue intrascendente. Oraciones y súplicas fluían en ambos lados tan libremente como los pájaros que daban vueltas encima de nosotros. Juntos oramos por las generaciones pasadas y por las aún no nacidas. Oramos para que sus vidas puedan ser vividas al máximo, y recordamos que ninguna frontera puede impedirnos ser una sola familia. Ralph McCloud es el director de la Campaña Católica para el Desarrollo Humano de la Conferencia Catolica de Obispos de los Estados Unidos. November 2nd is the day we Catholics celebrate our faithful departed. On a personal level, we remember those loved ones who walked with us on this life and have gone to the eternal home to continue their life journey. On the church level, we remember them as our brothers and sisters who share a common faith with us and have gone to continue their faith journey in heaven with all the angels and saints. Here on the border between the U.S. and Mexico, within the dioceses of Las Cruces, El Paso, and Ciudad Juarez, in the month of November, we have a tradition to celebrate Mass right on the border line. Smack against the border fence, we observe the feast of the faithful departed – Día de los Muertos, as it is known in Mexico and in other countries of Latin America – to pray in supplication and thanksgiving. We remember all our migrant brothers and sisters who have found death on their treacherous journey north, in search of a more dignified life for themselves and their families, often seeking to reunite with their fathers, mothers, sons, daughters, and other relatives. This tradition started a few decades ago, in the wake of the many border enforcement initiatives enacted to deter migrants from entering this country without inspection. Enforcement operations such as “Hold the Line,” “Gatekeeper,” and “Safeguard” have pushed thousands of people to try to enter through harsh regions and consequently increased the number of deaths along the border. To honor their lives and call attention to these deaths taking place along with the increasing militarization of the border, these three border dioceses started this beautiful and moving celebration that is now nationally known as the Border Mass. Several hundred people gather every year on both sides of the border, around a common altar, to celebrate the Eucharist, symbol of communion, in a place that seeks to divide peoples and families. We announce the Gospel of inclusion, remembering that we are all one family of God, called to walk with each other in love. We share the Body of Christ and exchange the sign of peace across the border through the fence, despite opposition from the border patrol officials and ground agents. The bishops of the three dioceses take turns presiding and the clergy of all three dioceses come to accompany the faithful, as we remember those migrants who have passed on to the eternal life. We pray for them in thanksgiving, for the gifts with which they have enriched the lives of their loved ones and ours. We also pray for change in our hearts, from hardened to welcoming, change in our immigration laws, for immigration reform, and for more Catholic engagement in advocacy so we can enact these changes. As part of this Mass, we bring symbols of faith and pilgrimage, of migration, suffering, accompaniment, unity and hope. We present an image of the Virgen of Guadalupe as mother and consoler, a backpack, water, sandals, our national flags, and a crucifix representing our common faith in our Lord and Savior, who strengthens and accompanies us all pilgrims, those who are coming, those who arrived, and those who have departed ahead of us. This is a wonderful moment of prayer and solidarity on the border. Virgen de Guadalupe, ruega por nosotros! Amen. Visit the U.S. Conference of Catholic Bishops’ Justice for Immigrants Campaign website to learn more about the Church’s work to promote positive immigration reform. The 2008 film “One Body, One Border” tells the story of the Border Mass. Learn more about the film.